I have watch them closely since their very first demo "The Way To Ades" which it was very hopeful!.Fortunately I didn't make mistake.Their first full-length album is a real dynamite.Harsh riffing pounding drumming and lots of battle roars..not to mention the real good sound quality! The self titled song starts with a loud war cry giving the signal to demonic hordes to ride towards to the enemy and spread death and destruction!The final attack starts with thrashy riffing close to the end of the song..Good time for moshing ors hould I say massαcre? "Cheronia" is following epic influences.Starts with a dark melody and then...attack! !A song full of blast-beats and with Lyrics in Hellenic Language reminds me a lot Naer Mataron which are the main influence of the band! 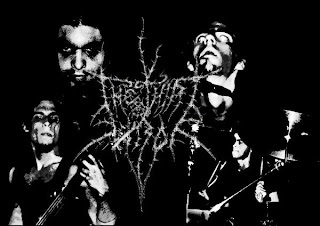 "Batlle Cry" has nothing to do with the well-known song from the old heavy-epic band Omen.Another aggressive black metal song that continues the war on your head and your ears..The Darkthrone and Mayhem influences are something recognizable here and sometimes you feel a Dissection Aura..Some beat-down and well played double bass drumming makes this song more groove than the other songs till now and the guitar playing in a little beat more melancholic tunes. "Catharsis".Another one speed up song with in you face attitude.Aggressiveness is something that is not missing from this song too.This one I'm sure that it would be great for live gigs! "Faith To Ares".In simple words.Suicidal(hopefully not like Shinning) Doooooooooooooooooooom!! !It's a very good track baptized into curse and agony.Although the whole song is a pray to the Hellenic god of war Ares.In the end the song speeding up.Not Bad at all but not so good as the previous songs,I'm sure that's good for live. "Heroes Of The Past","Necromancer" are not going to get away from the whole aggressiveness of the record so they keep their fate to blasts and high tempo feeling the war-concept of this album with the 90's Black Metal Influences being the base. The next one is "Sacred Land" which is a mid tempo song with many parts full of blast-beats and vocals in a incantation style.Another Mataron-like song! "Metal Warlord" is the something else track of this record.Sounds more power metal than Black Metal or you can say Power Metal With Black Metal production and blast-beat parts.This it will be one of the "hits"..!! "Polemos"...Means WAR in the hellenic Language...No comments for this song...THIS IS WAR!!! You can find many influences from Naer Mataron,old Mayhem and a little bit of old Darkthrone that makes that album sounds killer! Nothing else Order OR DIE!!! Αναρτήθηκε από HeadCrush στις 2:23 μ.μ.